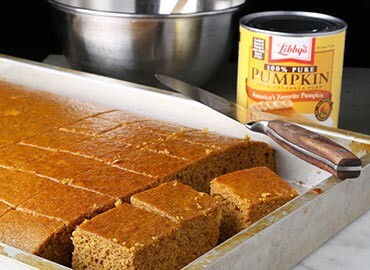 Alternative: substitute 2 ½ teaspoons of pumpkin pie spice for the allspice, nutmeg and cloves. Mix first five ingredients well. Mix dry ingredients. Alternate addition of water with dry ingredients and blend all well. 12×18” pan for 45 minutes at 350. Two 9×13” pans for 38 minutes at 350 ( 40 squares per pan) I cut them 5 across and 8 down. Done when center springs back after touch. Cool, cut, wrap well (saran wrap, baggies or foil) and freeze. 70 fit into one 21/2 gallon freezer bag. LABEL the bag.